The following review was written by a member of The Escapist community. For more information on community reviews, please see this forum thread. The release of LucasArts' back catalogue on Steam has thrust several formerly hard-to-find adventure games back into the limelight, letting old hands indulge their nostalgia and younger gamers see what all the fuss is about. Reviewing a game as old as Loom is problematic, because half of the things you would normally talk about are off-limits. Sure, the graphics and sound aren't up to much, but the game is twenty years old, so complaining about them is unfair. However, for the sake of completeness, I'll touch on them briefly. The graphics are actually quite impressive given the limitations of the old VGA palette, and while they don't hold a candle to the high-definition tour de forces that are released nowadays, they still manage to be evocative. Loom's background music consists entirely of excerpts from Tchaikovsky's Swan Lake and unfortunately it tended to just fade into the background, which seems something of an oversight in a game where music is so important. Loom is a departure from other LucasArts adventure games in that it isn't a comedy game like Monkey Island or Day of the Tentacle. There's some comedy in there, but for the most part it's presented as a serious fantasy story with some very dark moments in it. What's reassuringly familiar, however, is that it is impossible to lose the game and you can't actually die, meaning that the only obstacle between you and the ending are the puzzles. In Loom, craftsman guilds have evolved into societies based around a single trade. You play as Bobbin Threadbare, an apprentice of the Weavers Guild on Loom Island. The Weavers Guild has transcended the confines of ordinary cloth and is capable of spinning the very stuff of creation, giving them great power. Bobbin is ostracized from the rest of the guild, which he assumes is because he is such a terrible weaver. It is very quickly revealed, however, that Bobbin actually has great potential and an equally great destiny to fulfill. If this all sounds familiar, remember that Loom predates the Star Wars prequel trilogy by nine years. The story moves along at a decent pace, and the characters, while not especially well rounded, are compelling enough to hold your interest. I have to confess that I didn't click with Bobbin immediately and it took me a little while to warm to him, but that's a personal thing and your experience is likely to differ. 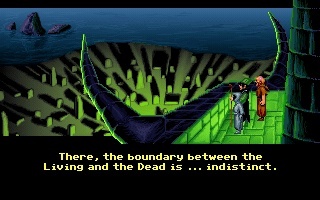 Loom does occasionally fall into a couple of clichÃ© sand-traps, but the originality of the setting more than makes up for it. To go into too much detail would take us into spoiler country, but let's put it this way: Summoning demons never ends well.